Australian Business Traveller speaks with the Chief Marketing Officer for Star Alliance member Turkish Airlines, who outlines plans for their new business class which will be introduced for Boeing 787 and Airbus A350s which will be entering the fleet, beginning with the 787s in 2019. They’ll be moving from 2-2-2 seating to four-across direct aisle access. And since “High privacy is our priority,” there’s the possibility of suites with doors. However the seats are still under design. We are still working on with our design partner for many different features such as individual enclosed storage areas and 44-inch knee distance. Turkish Airlines is known for flying myriad products, you never quite know what you’re going to get. And that will remain the case once they introduce their new business class — while all 787s and A350s will get the new seat, they do not plan to retrofit existing Boeing 777, Airbus A330 or A340 aircraft with new seats. They expect to take as many as 30 Boeing 787-9s and A350-900s. Six 787s enter the Turkish fleet in 2019, and five A350s in 2020. All should be delivered by 2024. Personally I can’t wait to see the business class lounge at the new airport opening in less than two months, considering how impressive the existing lounge is. 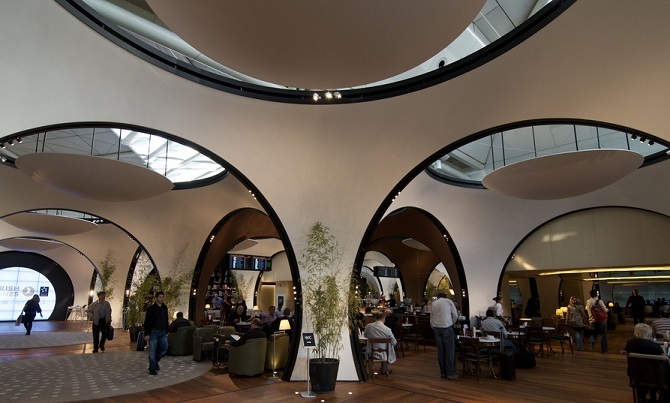 Turkish says there’ll be an even more premium lounge available, although it’s not clear what features that lounge will have or who will have access. The new airport will hopefully have better de-icing as well. That deicing method might be more environmentally friendly than most. Not so good for schedules though. I have a round trip for the beginning of November. Hopefully the new airport will be open on time and I can check out the new lounge. Things look good from what I can tell. The food will still be good, but not like it was sense Do & Co is being replaced with SIA catering. I love Turkish Airlines in economy or business. I can get direct aisle access in business or only two seats by the window in economy as Turkish flies the A330 from Dulles. It’s good to see the hard product will be slowly upgraded though. The SATS agreement has been canned. It will remain Do&Co. So hurra for that! That is great news! Thanks for the info. Air Italy Cuts Los Angeles, San Francisco, And Toronto Flights (Now Only Seasonal) - One Mile at a Time on THIS is What Delta, American and United are Running to President Trump Afraid Of?